The increase in the numbers of autonomous national and regional women’s funds in Latin America, Africa, and Asia during the second half of the 1990s represented a revolutionary innovation in the international world of women’s rights movement. 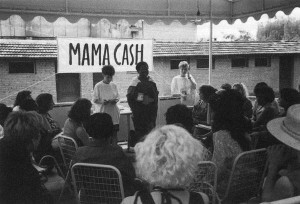 At the 1995 International Conference on Women in Beijing, Mama Cash and several women’s funds from the U.S. organised workshops during which African women in particular accused the West of forcing African countries into accepting a Western capitalist development model. The flow of financial resources from the Global North to the Global South contributed to maintaining the unbalance of power. Mama Cash agreed: ‘Sending money from the North to the South was missionary work, even if we tried to uphold our non-conventional strategies’, founder Lida van den Broek says. ‘The women from the South wanted things to change as much as we did. Women should set up their own funds in the South’. As a consequence, Mama Cash and the U.S.-based Global Fund for Women decided to start financially supporting initiatives focused on the creation of regional and national women’s funds worldwide. ‘Autonomous women’s funds in the regions were still a great dream back then’, Will Janssen, former Manager of the Fund for the Global South says. ‘Local women were better informed about the quality of, and the necessity for, the requests’. From that moment, Mama Cash and the Global Fund for Women dedicated a portion of their money to catalyse and strengthen new women’s funds. At first, women’s funds were supported by their sister funds in the ‘North’ with advice and money for overhead expenses. Marjan Sax, one of Mama Cash’s founders: ‘Women started to take responsibility for their money, and learned how to do fundraising in their own countries instead of depending exclusively on donors abroad. This helped them feel proud and independent’. Amalia Fisher, one of the founders of the Angela Borba Fund (now Fundo Social Elas) in Brasil: ‘Mama Cash taught us how to build a fund. We have an equal and respectful relationship. Mama Cash is like the big sister you never had’. The first women’s fund in the Global South was Sociedad Mexicana Pro Derechos de la Mujer (Semillas), founded in 1990. A few years later, in 1996, Tewa in Nepal was founded. 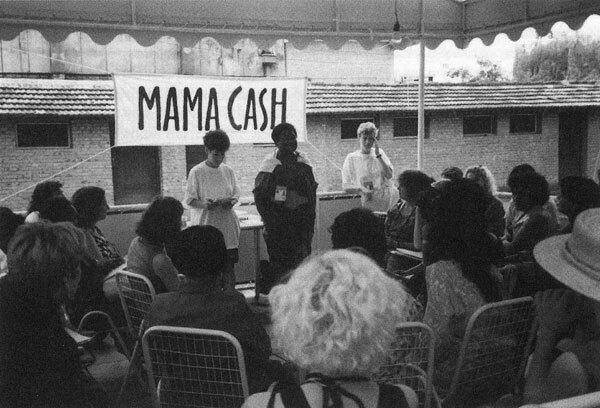 In 1998, during Mama Cash’s 15th anniversary celebration in Amsterdam, an international umbrella organisation for women’s funds was created: the International Network of Women’s Funds (INWF). From that moment, things developed rapidly. By 2001, women’s funds had emerged in South Africa, Ghana, India, Nepal, Mexico, Brazil, Mongolia and the Ukraine. 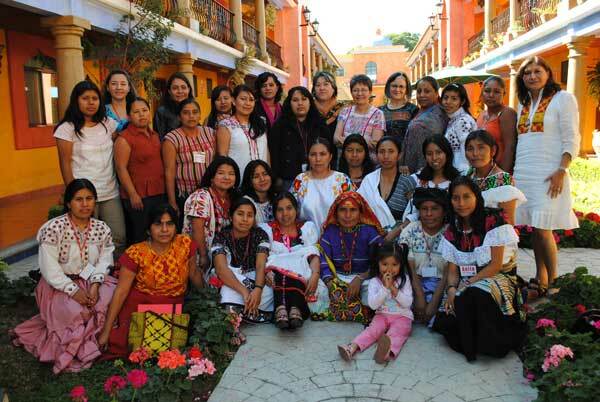 More than ten years later, this worldwide network consists of 45 feminist women’s funds. Each fund focuses on the needs of women in a unique way. But what they all have in common is the will to do their own fundraising, and to decide for themselves which women’s, girls’ and transgender groups to support in their country or region. Mama Cash’s commitment to women’s funds is evident. Since 2004, anywhere between one-fifth to one-quarter of her funds have been dedicated to women’s funds. The 2009-2013 Strategic Plan On the Move for Women’s Rights marked the beginning of a separate portfolio for women’s funds with its own dedicated staff. Mama Cash developed stricter grantmaking criteria, began giving larger grants and entered into much closer partnerships with its partner funds. Mama Cash now assists its grantee partner funds with varied organizational needs such as fundraising, communications and strategic planning. Mama Cash’s goal is to discourage dependence and to build the capacity of national and regional funds to do their own fund raising, both at home and internationally. Some examples of women’s funds supported by Mama Cash: Semillas in Mexico, the Mediterranian Women’s Fund en the South Asian Women’s Fund. Most women’s funds still face problems raising money in their countries and regions. Many people are not used to giving for women’s rights, or to fund women’s organising. To support regional and national funds in their fundraising efforts, Mama Cash launched the ‘Strengthening Local Fundraising Initiative’ in 2011. Through the initiative, women’s funds can work with experts from various fields, such as marketing, communications and fundraising, and also coach each other. Fund staff visit each other to exchange knowledge and experience, and they teach each other how to diversify their sources of income. Antonia Orr of Semillas: ‘People in our country still have many misconceptions about what it is that women’s funds do. We also find it is difficult to raise money for issues such as safe abortion, or support for indigenous women’s groups. We have had other women’s funds visiting us, such as the Women’s Fund in Georgia. We showed them, among others, the importance of investing in donor relationships. In the near future we will visit Mama Cash and the Global Fund for Women. Based on what we will learn from them, we hope to raise more money here in Mexico’.